Fluency disorders such as stuttering, cluttering, and atypical disfluency are often accompanied by concomitant speech and language disorders, as well as other disorders impacting and interacting with fluency. Despite this common presentation, there is little training for speech-language pathologists to confidently treat fluency disorders and concomitant disorders together. 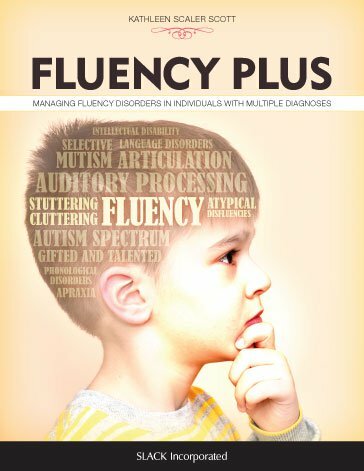 Fluency Plus: Managing Fluency Disorders in Individuals with Multiple Diagnoses fills this much-needed gap, providing a strong research base along with practical strategies and treatment activities to guide speech-language pathologists in managing clients with fluency and concomitant disorders. Dr. Kathleen Scaler Scott brings her years of clinical experience and her research in the areas of stuttering, cluttering and atypical disfluencies to Fluency Plus, designing it to act as both a textbook for students and a practical guide for the clinician. The comprehensive review of current definitions of fluency disorders and the evidence base for treatments will be of great help to students, while clinicians will appreciate the specific guidelines, strategies, and activities for managing fluency in concomitant disorders. After reviewing general principles and covering how executive functions relate to the management of these multiple concerns, the text addresses seven concomitant disorder areas the speech-language pathologist may encounter in practice. For each disorder category, an overview of potential fluency problems is provided, myths regarding treatment of fluency disorders in each population are debunked, and effective treatment activities are recommended. Fluency Plus: Managing Fluency Disorders in Individuals with Multiple Diagnoses helps close an education and training gap for students and clinicians alike by increasing their confidence, knowledge, and skills when dealing with fluency disorders and complex combinations of concomitant disorders. Kathleen Scaler Scott, PhD, CCC-SLP, BCS-F, is a practicing speech-language pathologist, board-certified specialist in fluency disorders, and associate professor of speech-language pathology at Misericordia University in Dallas, Pennsylvania. She has been a practicing clinician for over 25 years in school, hospital, and private practice settings. Her clinical and research work has included focus on the impact of executive functions on daily speech and communication. Dr. Scaler Scott’s research interests are largely in cluttering, atypical disfluency, and clinician training and treatment effectiveness. She is the co-editor of Cluttering: A Handbook of Research, Intervention, and Education (2011) and co-author of Managing Cluttering: A Comprehensive Guidebook of Activities (2013), both with Dr. David Ward. Dr. Scaler Scott has spoken nationally and internationally on the topics of fluency and social pragmatic disorders. She is a certified special education and elementary education teacher and was the first coordinator of the International Cluttering Association.